Wendy's phenomenal book is so insightful and very much on point! Excellently written! I read this book in 6hrs and over 2 days, it was that captivating! Your work has been deeply motivating and I thank you very much! Most dentists feel sick when they think about marketing. This concise handbook shines a light on how dentists can put a method to their marketing in order to safeguard the practice for years to come. Deploy the plan for steadfast results! The transformation is measurable. 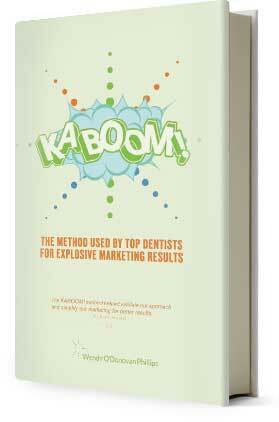 Dental practices that apply the Kaboom! method enjoy validation of their efforts, higher returns on marketing investments, more stability in patient traffic and production dollars, steady growth and increased practice value. Kaboom! is filled with concise analysis of why certain marketing tactics work best, and when. It covers four dental marketing strategies and fifteen tactics. Top ten lists offer key things to avoid and tips to pursue. The book helps dentists build thriving practices with marketing backed by real methodology.